I wasn't able to follow any other advice on how to root my Droid Incredible once I upgraded to Verizon's Gingerbread 2.3.4. I found some articles describing how to downgrade the firmware and then use unrevoked to root the phone but I had no luck getting these instructions to work. 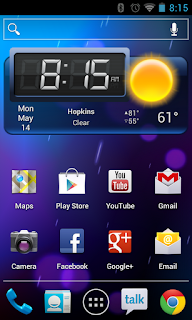 Instead, I followed my own path using HTC's bootloader unlock tool which was released for the Droid Incredible. My only complaint with HTC's bootloader unlock tool was the necessity for using Windows to unlock the phone. I attempted to use Wine under Ubuntu with no success. I have a virtual Windows 7 using VirtualBox that may have worked but I was tired and decided to use another computer in my office. Once rooted, can't rent Movies from Google Play store. Composite video output via special cable has never worked on CyanogenMod and I didn't expect it to magically work. I believe, HTC created the video output prior to Android having an API for HDMI outputs let alone working with composite video. 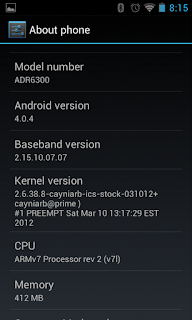 I don't have Verizon service on this phone any longer so I can't test phone functionality but I was able to get it to call *228 to try to register with Verizon and I have gotten phone to work with previous versions of CyanogenMod. One SD Card -- I'm using a 16 GB card. SD content is not touched following my instructions but be careful there are some options that will format your card and then your backups and other content will be deleted. Reboot the unlocked phone to Bootloader by holding the Volume Down while pressing Power to turn on the phone. Hold the Volume Down key while booting to get to the Bootloader and Choose 'Recovery' to start the recovery-clockwork application. 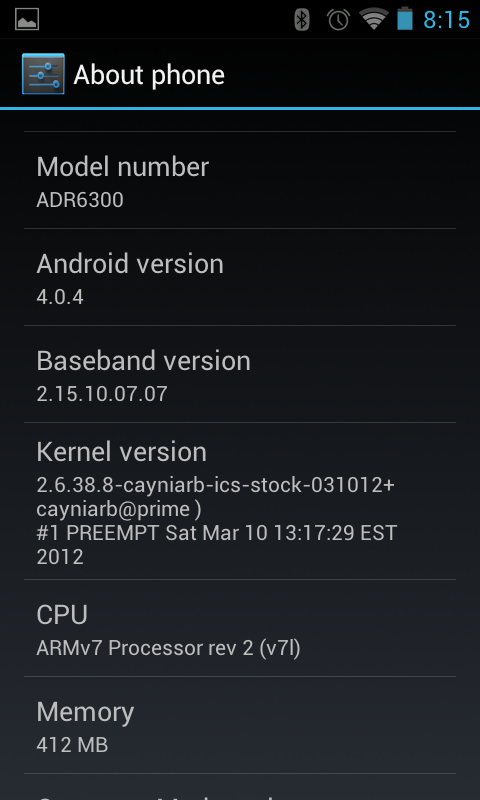 Finally 'reboot system now' and wait for ICS to build some packages for the first time. 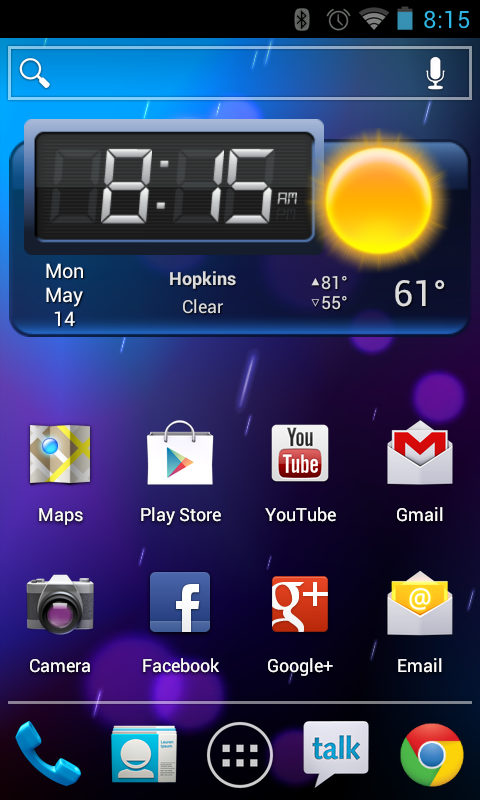 I'll try to fill in more details and take some pictures of the Bootloader and the Recovery Screens. I upgraded to Ubuntu's newest version 12.04 Precise Pangolin earlier this week and ran into a problem with Handbrake working. The website offers a ppa repository that unfortunately does not have an updated binary package or repository for the new version of Ubuntu. Then run 'sudo apt-get update' or 'sudo aptitude update' to update the local software database. We unfortunately have some devices inside our hospital that cannot be rebooted after applying updates. These are not critical patient care devices but they are used sporadically 24/7 and therefore we cannot schedule a clean reboot. For example, we have a computer that is being used during a sleep study that is not directly used all night long (cannot click postpone reboot) but that nevertheless needs to be managed. Our current solution is to apply updates to a specific group of computers and then have our application team manage rebooting those machines at their convenience.